An usual combination of dice and Vikings is the topic cover by the 100 Dice video pokie by EGT, but a quick check on Google confirms that these Nordic people played lots of dice games, so maybe there’s some logic to it. Set in a typically frozen landscape, the multicoloured dice and images of longships, shields and helmets appear across 5 reels in 4 rows, and running from left to right, there’s a total of 100 paylines that give the game its name. Everything is in a fun cartoon style and is accompanied by some nice animations including a Viking banging his shield and the boat sailing off to pillage some unfortunate town. Behind the reels is a nice picture of mountains, trees a wooden building and of course, lots of snow, while below the game is the control panel, where bet sizes are selected and where players can choose to set the reels spinning on Autoplay or not. The low limit stake to get all lines in play is 1.00, although there’s an option to active just a few at a time, or even try free 100 Dice video pokie games just to try it out before playing for real. If less than all 100 lines are used however, players won’t qualify for all winning combinations that land, and in the base game, they will need 3 or more of the same symbol type to stop across an active line, on adjacent reels running from the left side. Bonus features like free spins, stacked wilds and scatter awards will all help to boost bankrolls, plus there’s an option to gamble each win and a 4-level progressive jackpot that can be won at any stage. A review of the pay table will reveal what each symbol is worth, and the dice make up the lower end, paying from 5, 25 or 100 coins when the light blue or pinks dice stop on 3, 4 or 5 reels of a line, up to 10, 100 or 200 coins for the dark blue or yellow ones. To win more, players will want to see the Vikings landing on the reels, and each of these symbols is shown as being on a dice, with the ship and a carved dice being the most valuable at 50, 200 or 600 coins. 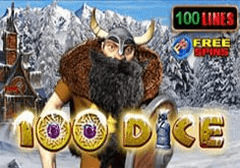 A suitably wild Viking is the wild symbol of this pokie, and he’s worth up to 1000 coins, while also being able to substitute for all but the scatter symbol, completing winning combinations, or extending wins across further reels for higher prizes. The scatter is a shield and axe symbol, which pays out 200 coins when it appears in any positions on reels 2, 3 and 4 at once, also triggering 10 free spins. These bonus games are played out on a richer set of reels, which should help players to get a few nice prizes along the way, and if 3 scatters appear at any point in the bonus games, an extra 10 spins are added on to the end. Any win of less than 3500 coins can be gambled, potentially turning a small prize into a substantial one, although also potentially losing it. 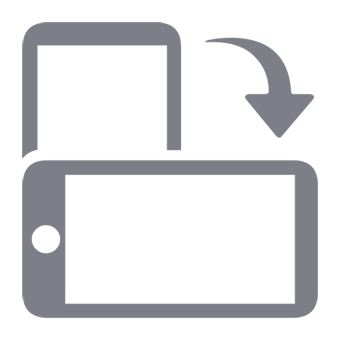 To double the win, players will need to correctly guess if a rapidly-flashing playing card will stop on red or black, and can repeat the gamble if they get it right. There’s also the Jackpot Cards progressive feature, which can be triggered after any spin. Above the reels, there’s 4 progressive totals, increasing in value from the Club jackpot, through Diamond and Heart prizes to the highest Spades prize. Players who enter this round will win one of these when picking from a grid of 12 face-down cards, and the jackpot they win will be linked to whichever card suit they find 3 times out of the 12. The unique combination of Vikings and dice works pretty well, and there’s some pleasing animations to accompany any winning lines, such as the wild Viking banging his shield and the boat floating around a bit. Simple but effective. Bonus features are also quite simple but effective, as wild substitutions and free spins are nothing that online casino players haven’t seen before, but they are proven to be popular and to work well. 100 Dice by EGT is a game that should be tried out at least once, and anyone who likes the style and gameplay could find themselves returning to these frozen reels again and again.